An easy drive from Bourke to Cobar, 160 odd Km south of Bourke on the Kidman Way. 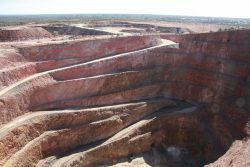 Cobar (“Copper City”) has been a major producer of copper, gold, zinc, lead and silver, second only to Broken Hill in NSW. It became best known as a copper-mining centre, and it is still most widely known in that connection. 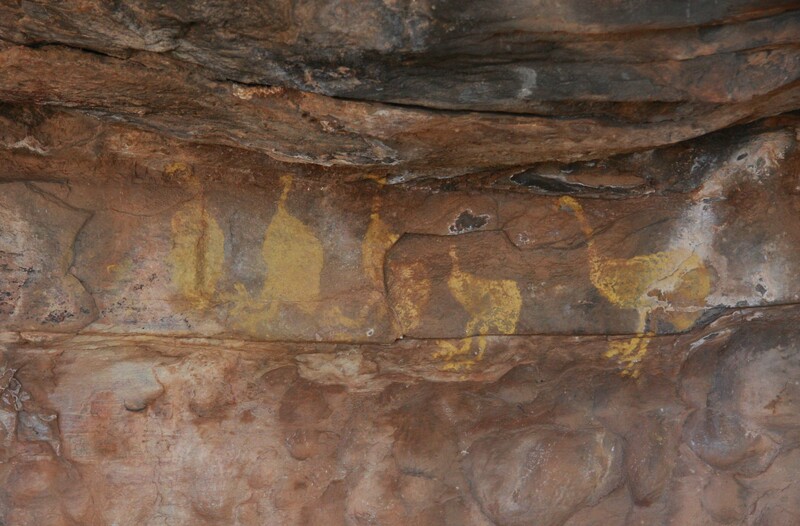 Once set up, I went to Mt Grenfell Historic Site for a picnic and to see some aboriginal artwork. 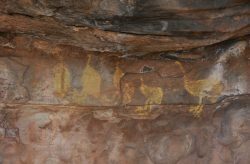 Sadly the artwork was badly weathered, but it must have been magnificent when fresh. Lots of different shapes rather than just hand silhouettes. 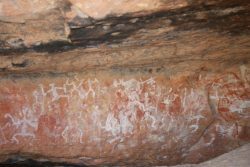 Sadly there are no aborigines alive who can interpret the paintings, or maybe they choose not to. The rock overhangs that house the artwork are surrounded by treed, rocky, undulating country, a great setting. There was a waterhole that the aborigines used near the rock art, it was dry, but a lovely spot amongst the rocks. 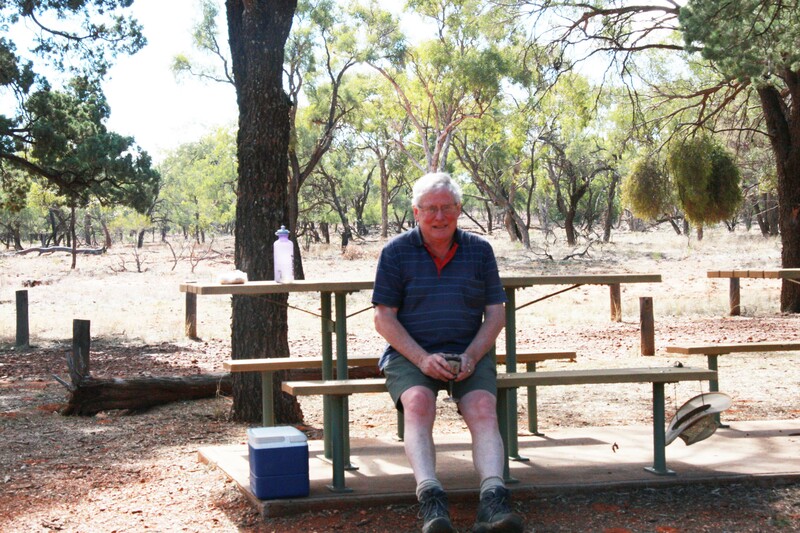 The picnic area at Mt Grenfell was attractive with scattered trees and plenty of tables, which I had to myself. I haven’t taken one of my trademark picnic table photos this holiday, so here it is. Near Cobar is the Fort Bourke Lookout, 300 metres high, that is above a massive gold mine. You can just see the tunnel at the bottom that they are now mining, after mining the open cut. It is a massive hole, I didn’t spend long at the edge. Mining started here in 1871 and the mining then was via conventional shafts. The view from the lookout in the opposite direction is over extensive mulga plains. You may notice the wattles at the left just starting to flower. 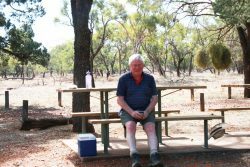 While I was at Cobar I met Terry and Jo, a couple from Cobram, who were camped near me, they are genuinely lovely people. We had some good conversations and they invited me to have dinner with them on the day I drove to Mt Grenfell, so I didn’t have to worry about cooking tea. Jo made a delicious mushroom fettuccini with chicken, cream, parmesan, seed mustard, and garlic. They shared the leftovers with me so I have another meal ready to go, bonus. They had had some tragedies in their life including losing a son killed in a hit run at 4-1/2. So they were very understanding when I talked about Margie, and I was able to reciprocate about their losses. 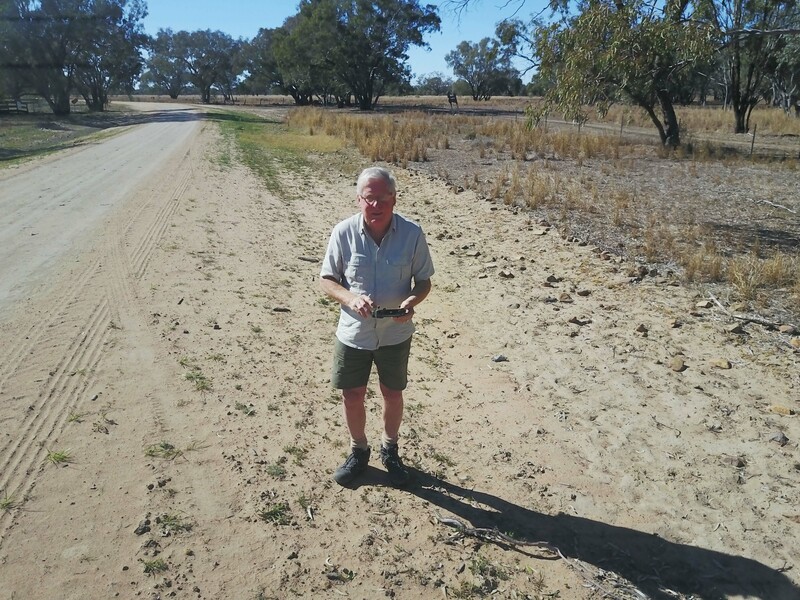 The drive to Coonamble was just over 300 Km and a very easy drive with few towns. 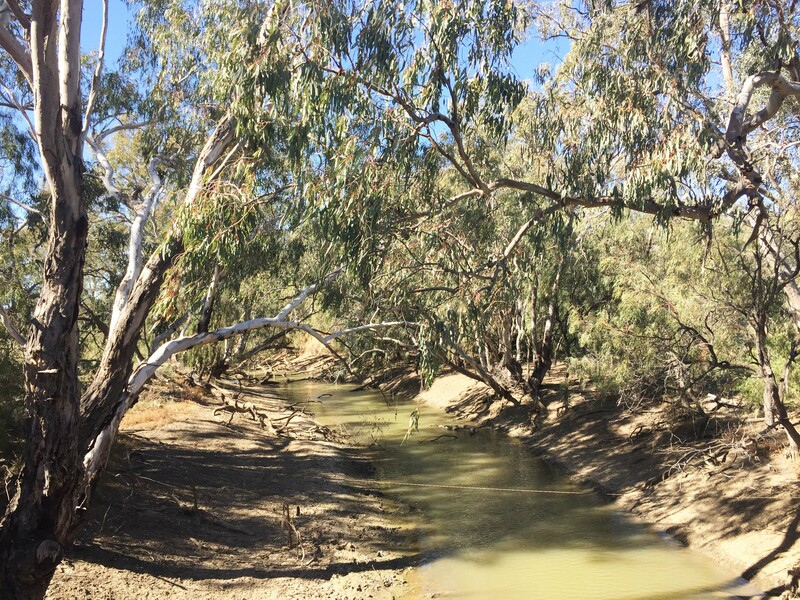 The country around Coonamble is the flood plains of the Castlereagh and MacQuarie Rivers. Very flat but with lots of trees of good size. I came here to visit the MacQuarie Marshes that are the largest semi-permanent wetlands in south-eastern Australia covering 200,000 hectares. About 10% is a nature reserve and the balance is in private ownership and is grazed. 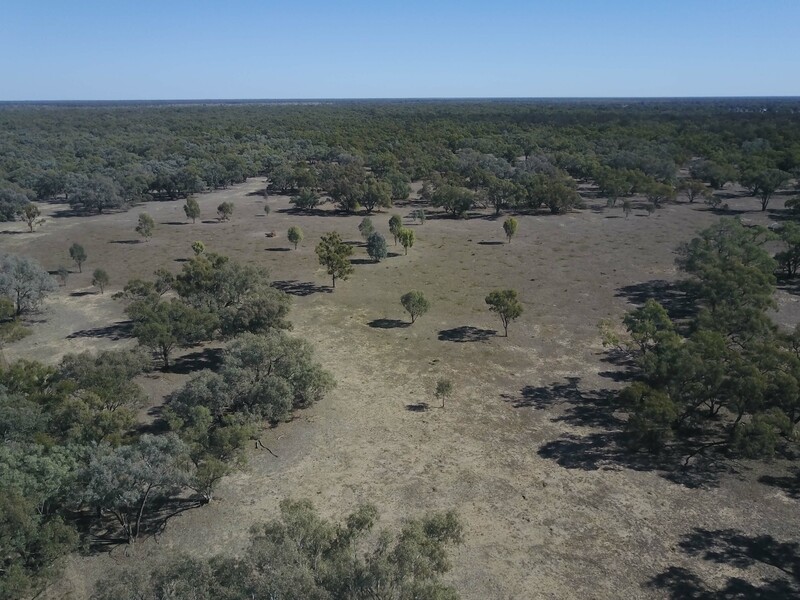 The marshes are covered with reeds, grasses and red gums, but at the moment the marshes are fairly dry, and diversion of water for irrigation has depleted the health of the wetlands. The road through the marsh was a dirt road some 25 Km long, which gives an idea of how extensive the marsh is. The drive is an enjoyable one with lots of trees on both sides of the road. 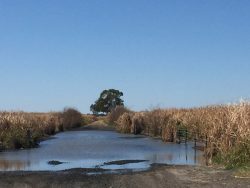 There are many floodways across the road and at one place I had to drive through water about 1/2 metre deep, this part of the road had reeds alongside over the height of the car. The road also crossed the MacQuarie River, which was like a small creek, in fact some of the many creeks I crossed were bigger. When you get out of the car to take a photo or look around, the bush is silent except for the sound of many birds. I haven’t used the drone for a while so I put it up to view the dry marshes. I did also indulge in a drone selfie. 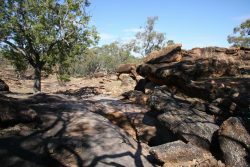 I am off now to the Pilliga Forest for a couple of nights. Wow Russ, loving the photos. You sound like you are having a great trip and meeting lots of great people. It’s nice to see the wattles in flower. 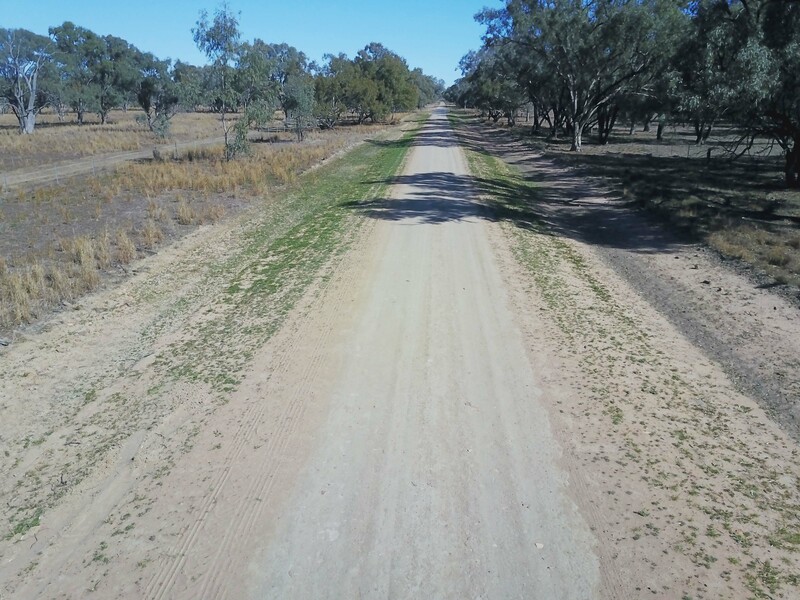 Its apparent from all your posts that it seems to have been very dry in the areas where you have travelled where you might have expected more water. Is it a particularly dry year? It has been and is a particularly dry year in NSW and Qld. 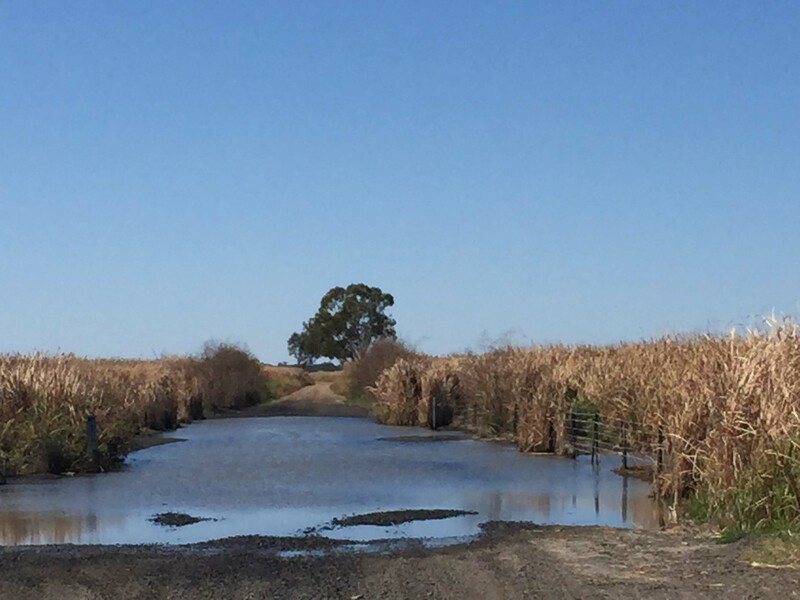 Some areas have had enough rain to keep grain crops going but lots of areas face putting stock onto their crops if they don’t get rain in the next few weeks. In contrast Victoria and lower NSW have had reasonable rain. 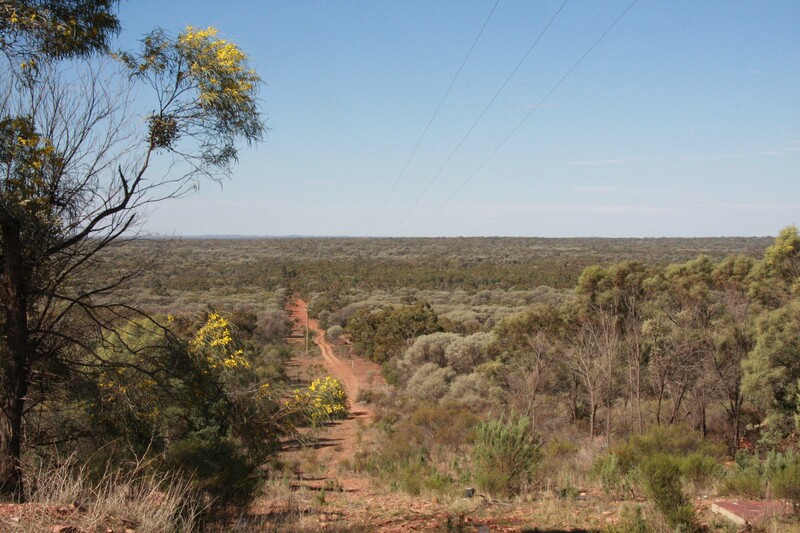 The area I have been in is normally dry, for example Tibooburra has around 250 mm of rain per year. 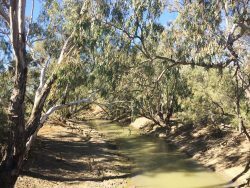 Irrigation around places like Bourke using water that fell in Qld feeding rivers of the Murray-Darling system allows crops of cotton and rice. In my opinion rice and cotton exports are like exporting water from the dryest continent (apart from Antartica. The dry is why the roads have been so bad because they need rain to wet the roads to grade them. Lots of Grey Nomads like me also mean more traffic that damages the roads.